Google “Karakuri Kaizen,” and you see a small number of Youtube videos from Japan, Thailand, Italy, and Hong Kong showcasing materials handling devices that rely on gravity, levers, cams and inertia to move bins in elaborate ways, transfer parts between machines, or deliver a controlled number of small parts to an operator’s hand. Don’t use the human hand. Move objects automatically. Use the force of your equipment. Build it with the wisdom and creativity of the people of the shop floor. For safety, don’t just rely on paying attention but build a device that stops automatically. While “Karakuri Kaizen” is an alliteration that rolls of the tongue almost as easily as “cash for clunkers” or “toys for tots,” you may still wonder where “Karakuri” comes from and what it means. Until “Karakuri Kaizen,” I had never heard it stand-alone but always as part of “Karakuri Ningyo,” or Karakuri Dolls, which are wind-up automata with wooden gears and levers developed at toys in 18th-century Japan. The best known are tea-serving dolls, like the one in the featured image. 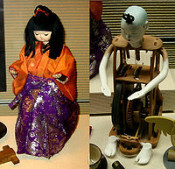 As Karakuri dolls are a reminder of ancient ingenuity, the term has a positive connotation in Japan. I once used a picture of one in a magazine ad for US-made automation software, to connect the product with the local culture. But the term, obviously, means nothing to anybody who is not Japanese. and how Japanese workmen and their managers view it. any way learning for me sitting in a emerging country like India where still the G M Culture of Command and Control is the order of the day combined by the apathy of a whole generation of engineers who are just not fit for the job either theoretically or practically. under education business they all have degree ascribed to them. that is the end of the story. Retired H R Executive from manufacturing Industry.